Nine-year-old Zhang Zhishuo lived in the Dadong District, Shenyang City, Liaoning Province. Her mother was arrested in the run up to the Olympics for practicing Falun Gong and was sentenced to one year in the Masanjia Forced Labor Camp, without any legal procedures, or notification of her family. So far, no information about her is available. Zhang Zhishuo came to New York with her grandfather last September, and learned that her mother had been arrested. No words can describe this nine-year-old girl's grief. She said that Falun Gong teaches people to be good people, and she does not know why the Communist Party persecutes it. 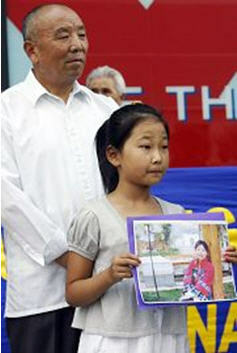 She read a letter to New York City Council members and President Bush at a press conference, hoping that they can help her mother so that she will be able to meet her mother soon. Her mother, Jia Yahui, is a reporter for Liaoshen Evening newspaper. Agents from the National Security Department arrested her in April when she attended her cousin's wedding ceremony. The police broke into the house and said that they wanted to talk to her about something, and then took her away. Her family finally learned that she was sentenced to one year of forced labor for not giving up her practice of Falun Gong.